Every school year a unique one-year course of general music education starts for boys and girls from the age op 6 and up. This programme works with a method developed by Rintje te Wies: ‘Een leven lang zingen’ (A lifetime of singing), which is already in use by many choir schools nationally. Songs constitute its base and are the reference point for all the other components. All the teaching materials around theory and formation of hearing continuously refer back to the songs. 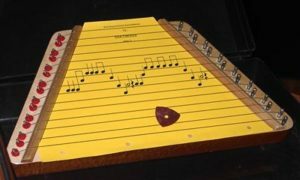 The practice of these songs at home is enhanced using a cimbalom. By way of cards with musical notation that can easily be pushed under the strings, the children can accompany themselves at home on this instrument. Playing and singing thus go hand in hand. The light, natural sound of the instrument stimulates light and clear use of voice. Using uncomplicated motor skills, all the songs are easily brought to life on this instrument. The paper version is supplemented by an interactive companion website. Here children can go to find playful practice series to learn how to read music notes. The questions and assignments surrounding the theory have their auditory continuation here. Also, the development of hearing, rhythmic as well as melodic, is enriched here though dozens of listening exercises which the children can do at their own speed. In addition, it is the ideal place to clarify exercises around vocal formation through the use of short illustrative videos, listening fragments and accompaniments.